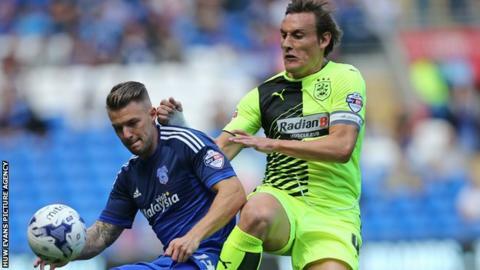 Cardiff preserved their unbeaten start to the season as two second-half goals saw them overcome winless Huddersfield. The hosts started brightly with chances for Kenwyne Jones and Joe Mason but both sides struggled for fluency in a goalless first half low on quality. Anthony Pilkington made the breakthrough with 20 minutes left as he fired neatly into the bottom corner. Joe Mason then finished into an empty net to lift Russell Slade's side into second place in the Championship table. For Huddersfield, meanwhile, a second successive defeat leaves Chris Powell's side still searching for a first league victory of the season. They handed debuts to three new signings in the Welsh capital and one of those, goalkeeper Jed Steer, was called into action after just two minutes as he saved Jones' firm 12-yard shot. Although Cardiff fashioned another chance for Mason, who fired wide, they defended nervously and almost fell behind when Sean Scannell's fizzing ball across the six-yard box was cleared by Fabio. The first half rather petered out from that point, becoming a sluggish affair in which neither team was able to hold on to possession for any meaningful length of time. There was more urgency after the break, Huddersfield's Harry Bunn darting into the box and seeing his low effort blocked by Sean Morrison. Jones had a glorious opportunity to put Cardiff in front but, clear on goal after Joe Ralls' through ball, the Trinidadian striker shot tamely at Steer. He was soon replaced by Sammy Ameobi, and the substitute had an instant impact as he found Pilkington, who turned and shot in one slick movement to score against his former club. Ameobi, on loan from Newcastle, was involved in the second goal eight minutes later as he prodded the ball beyond Steer for Mason to score into an empty net from a tight angle. That sealed a third straight league win for Cardiff, the first time the Bluebirds have achieved that feat since the 2012-13 season in which they were promoted to the Premier League. "It took a while to get some element of control of this game against resolute opposition. "The impact Sammy [Ameobi] made was excellent and he had a hand in getting us the goals. After that we settled down and were comfortable enough. "At times we were a bit sloppy and the fine detail was not quite where we have been in recent weeks, but we had enough belief to get the result. "We are looking solid and difficult to break down as well as creating chances." "That (not being awarded a penalty for a foul on Harry Bunn) was the turning point in the game. Before that we dominated the first period but failed to find the final product. "It petered out in the second half but we felt that was a penalty straight away. "If the defender had got the ball then it would have deviated, but the ball continues along the same line. "Then you're talking 1-0 to us instead of 1-0 down just seconds later and then we're chasing the game. That's just the way it's going for us right now. "It's not the start to the season that we wanted, but we've had to deal with a lot of players coming and going and we're trying to gel as a team as quickly as possible." Match ends, Cardiff City 2, Huddersfield Town 0. Second Half ends, Cardiff City 2, Huddersfield Town 0. Fabio (Cardiff City) is shown the yellow card for a bad foul. Mustapha Carayol (Huddersfield Town) wins a free kick on the left wing. Foul by Fabio (Cardiff City). Corner, Huddersfield Town. Conceded by Matthew Connolly. Sammy Ameobi (Cardiff City) wins a free kick on the left wing. Corner, Huddersfield Town. Conceded by Scott Malone. Offside, Huddersfield Town. Joel Lynch tries a through ball, but Nahki Wells is caught offside. Substitution, Cardiff City. Aron Gunnarsson replaces Joe Mason. Attempt missed. Sammy Ameobi (Cardiff City) right footed shot from a difficult angle on the right misses to the left. Attempt blocked. Sammy Ameobi (Cardiff City) left footed shot from outside the box is blocked. Assisted by Joe Mason. Attempt missed. Ishmael Miller (Huddersfield Town) left footed shot from the centre of the box is high and wide to the left. Assisted by Mustapha Carayol with a cross following a corner. Corner, Huddersfield Town. Conceded by Anthony Pilkington. Tommy Smith (Huddersfield Town) wins a free kick in the defensive half. Foul by Anthony Pilkington (Cardiff City). Goal! Cardiff City 2, Huddersfield Town 0. Joe Mason (Cardiff City) left footed shot from the centre of the box to the centre of the goal. Assisted by Sammy Ameobi. Nahki Wells (Huddersfield Town) wins a free kick in the defensive half. Offside, Cardiff City. Scott Malone tries a through ball, but Joe Mason is caught offside. Substitution, Huddersfield Town. Ishmael Miller replaces Jamie Paterson. Substitution, Huddersfield Town. Mustapha Carayol replaces Harry Bunn. Goal! Cardiff City 1, Huddersfield Town 0. Anthony Pilkington (Cardiff City) right footed shot from the centre of the box to the bottom left corner. Assisted by Sammy Ameobi with a cross. Attempt saved. Joe Mason (Cardiff City) right footed shot from the right side of the box is saved in the centre of the goal. Assisted by Peter Whittingham. Scott Malone (Cardiff City) wins a free kick in the attacking half. Attempt missed. Peter Whittingham (Cardiff City) left footed shot from outside the box is close, but misses to the left. Assisted by Fabio. Substitution, Huddersfield Town. Emyr Huws replaces Jonathan Hogg because of an injury. Delay in match Jonathan Hogg (Huddersfield Town) because of an injury. Substitution, Cardiff City. Sammy Ameobi replaces Kenwyne Jones. Attempt saved. Kenwyne Jones (Cardiff City) right footed shot from the centre of the box is saved in the centre of the goal. Assisted by Joe Ralls. Jamie Paterson (Huddersfield Town) wins a free kick on the left wing. Attempt blocked. Harry Bunn (Huddersfield Town) right footed shot from the centre of the box is blocked. Assisted by Jonathan Hogg. Foul by Joe Mason (Cardiff City).